Seagreens® produces its own range of nutrition products, 100% Seagreens® with no other ingredients. They have an established reputation among consumers, practitioners, the media and other stakeholders. Seagreens® branded Ingredients are available to manufacturers of quality health and food products. Manufacturers like Pukka Herbs, Napiers Herbal Apothecary, Viridian, Marilyn Glenville, Bioteekki and many others choose Seagreens® ingredients, and as Brand Partners, have access to the Seaweed Health Foundation and our academic partners for individual and co-operative research, possible licensing and use of new health claims. Through the Seaweed Health Foundation, Seagreens® has conducted early studies relating to cardiovascular health, obesity, diabetes and digestive health with promising results. The successful use of Seagreens® by many nutritional therapists provides a valuable resource and community of interest. Seagreens is available to educate and inform nutrition students and practitioners, and groups including cancer and other special interest centres. There are Camphill Communities in all parts of Britain and in 19 other countries caring for adolescents and adults with a wide range of special needs. 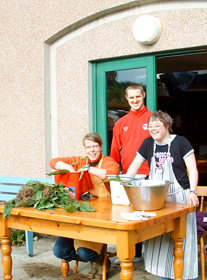 At Beannachar in Scotland their Herb Workshop produces natural remedies and nutritional supplements, including Seagreens® Microgranules in a Green Superfood mix and a carefully Targeted Nutritional Support formulation.